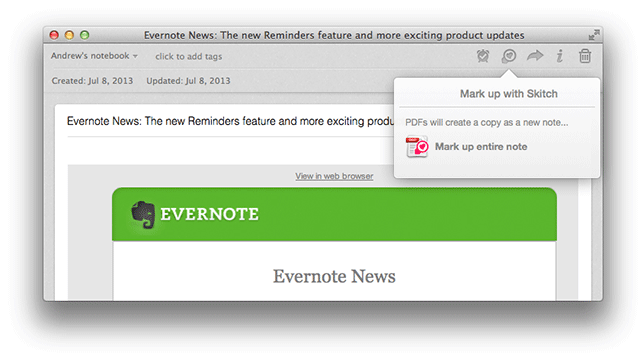 Evernote for Mac has gotten a nice update today that brings closer integration with its Skitch image markup tool. The new version also includes a full document preview tool and a new highlighter for text as well. The Skitch integration is relatively tight, as there’s now a new ‘Mark up with Skitch’ button in the header of a note. It crafts a PDF version of the note, email or what have you that you can mark it up and share it with others. This is a relatively clever solution that should encompass most types of multimedia notes. You have to have Skitch installed, obviously, but that’s free. Once you do, you can save it back to Evernote to share it or keep it for later. If there’s just one image in your notes that you need to annotate, you’re able to do that alone, rather than as a whole new PDF. There’s also now a document preview mode that lets you peek at many document types quickly from right inside the note. You can save those documents out as a new file right from the menu bar. They’ve also added a new highlighter for text, which is funny as I assumed that Evernote already had one. I suppose I don’t highlight much. Anyhow, the new version of Evernote for Mac is available now and the premium version even lets you search within documents attached to notes.